You lead work projects and in order to successfully bring your projects in on time and on budget, you need your staff on the same page with you. A great way to do this is with real time collaboration. You should have a shared calendar, task list, reminders, a way to organize documents, and a journal. I am a big fan of the 37signals Basecamp project management tool. The Basecamp tool becomes even more powerful when used with the other 37signals collaboration tools - Highrise for Contacts and Backpack Organizer. Online project management and collaboration tools make it easy to organize projects around your team. "Highrise: CRM With 37signals’ Simplicity" [PCTechTalk.com] offers a thorough look at Highrise and says, "If you’ve ever thought that you’d like a better solution for managing your customer info, definately give Highrise a try." Beyond contacts, deals are Highrise’s second major focus. This is where you can add information about proposals for jobs your company is bidding for, and obviously works best for firms that do individual jobs for clients. 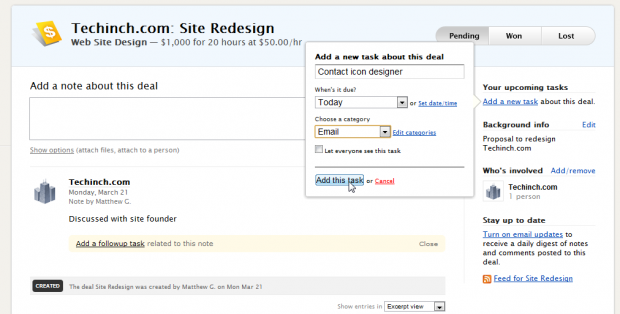 Highrise lets you enter the bid value, add tasks related to the project. This is a great way to keep track of who’s involved with a project with Highrise’s great contact management. Even if you’ve won a bid, you can still use your deal page to keep track of the ongoing project. Whenever you receive emails about the project, you can forward them to your unique email addresses generated by Highrise for each project, and they’ll be automatically added as a note. Marketing agency True Hero asks, "As business grows, client lists expand, taxes are due, and calendars filled up, how do you keep organized?" The answer is a list of tools to keep track of people, places, and things — and Highrise, Basecamp, and Backpack make the cut. 3. Backpack is part of 37signals like Highrise. If you have the $99 package, Highrise, Backpack, and Basecamp is included. No need for Google Calendars – Backpack has a group calendar. A great alternative to mass emails, notifications and group organization. The 37signals tools work well together – one place, one app, easy. The rest of the list includes tools like MailChimp, Mint.com, and Quickbooks. Check it out. If you’d prefer to simplify your billing, you can pay for 37signals products in one lump sum. We’ll then pull from that credit instead of charging your card every month. We’ll email you when your balance runs low so you can recharge it. To set up lump sum payment, click the “Account” link at the top of any screen. Then click the link for lump sum payments. You’ll still get an invoice each month. When your lump sum is running out, we’ll send you an email to let you know. We just pushed an update to Highrise that we're excited to share with you. Browsing activity about your Highrise Contacts, Cases and Deals is now much faster and more fun. You can just scroll through activity streams to see everything—no need to click 'next page'. When you reach the end of the page, Highrise automatically loads any additional items. You can try it now by going to the Latest Activity screen in your Highrise account. Just scroll to the bottom to see more items. Keep scrolling, and more items will appear. It's really fun and nearly instant. And it works anywhere there are activity streams including Contact, Case or Deal pages. We think you're going to love it. Thanks for being a Highrise customer. 21 Everest is a third-party extra that brings Highrise to your Windows Phone. (Note: This is a read-only app. You cannot update/add new data to Highrise with it.) It costs $1.99. More screenshots of 21 Everest. "Reduce 'Getting it All Done' Content Marketing Anxiety: Create Your Own System" [Content Marketing Institute] is a guide to help marketers design their own workflow system. Highrise is one of the recommended tools mentioned. Highrise is marketed as a CRM app, but it has this really cool functionality that lets you manage tasks by client (or “contact”) and by due date. I customized it to how I work and now I know when I need to make follow-up phone calls or emails and when a task is due. I now see my task list by day and by week, which helps me stay focused. O, The Oprah Magazine, listed "Web Tools to Keep You Organized" and Highrise made the list. You don't just enter names and phone numbers at Highrise. You can also include identifying information, like whether you've met in person or which projects you've collaborated on. You can even jot notes about your last phone conversation and check a box if you need to follow up (you'll get an e-mail or text reminder). Invite your colleagues to join, and you can collaborate and share information via the site. Fun news for us, especially since our new office is right across the street from Harpo Studios! 1) In Highrise, I assign a tag to a specific group of people I want to contact, perhaps just "Clients". 2) In MailChimp, I create a new list and tell it use contacts from Highrise with the "Clients" tag. 3) After the campaign is created and sent, MailChimp will then create a note for each of those contacts within Highrise describing what time the email was sent to them and how many times they've opened or clicked on items. 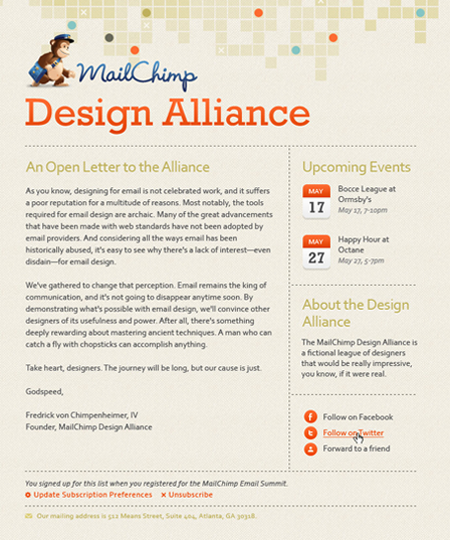 MailChimp also creates a new case in Highrise where it lists all the details for the campaign. I think MailChimp provides updates for the campaign for only 2 days in Highrise, but it's still very easy to set up and gives enough information for what we need. More details at the thread. Mumboe provides web-based software that helps businesses manage their contractual agreements with customers, partners and employees. And it integrates with Highrise. If you’re like us, you have a CRM system and a contract management system. Both include important information about your clients, but they are two distinct silos of information with different purposes and functions. Customer phone, address, and email information is common to both and that information needs to be accurate, current, and identical in all locations. As users of Highrise, we needed a way to import and sync our contacts with Mumboe. Fortunately Highrise has an API and we were able to tie the applications together. We thought this would be a useful feature for all Mumboe users who also happen to use Highrise, so we made it available to everyone. 37signals has now graciously listed Mumboe on their Extras & Add-Ons page for products that work with Highrise. If you would like to sync your Highrise account to your Mumboe account you can do so on the Admin >> Settings >> Sync External Contacts tab in Mumboe. We also have a short video tutorial covering Contacts to help point you in the right direction.